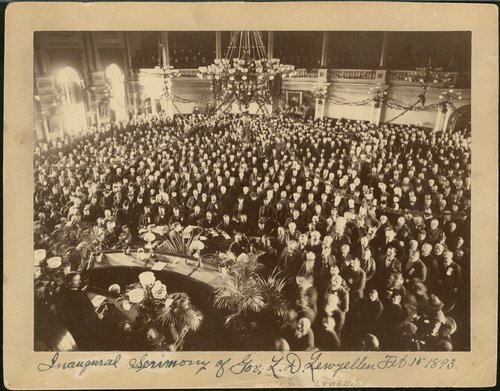 A photograph showing the inaugural ceremony for Governor Lorenzo Lewelling held in the Kansas House of Representatives. Lewelling, a Populist, served from 1893 to 1895. It was during his term that a dispute between the Populists and Republicans erupted and both parties separated and formed their own houses. This separation of the political parties in the House of Representatives is often called the legislative "war" of 1893.